Head over to get this Disney Doc McStuffins ORIGINAL Doctor's Bag for ONLY $6.58 (Retail $19.99)! Your stuffed animals and toy friends are ready for their check-ups! 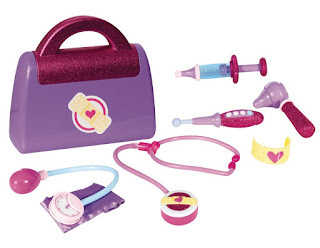 Disney Junior's Doc McStuffins Doctor's Bag Set includes a new and improved Doctor's bag, sparkly syringe, blood pressure cuff with working gauge and glitter vinyl cuff, glittery otoscope, bandage cuff bracelet, and a bandage box that dispenses colorful bandage stickers! Of course, Doc's magical stethoscope is included featuring sounds and light-up. Now your little Doc can "practice" her skills and nurture her favorite toys back to perfect health.